Today I’m going to share with you the easy way that I “cheat” to get extra greens in my diet. I love, love, love fresh squeezed fruit and vegetable juices and I’m always up for trying new kinds, particularly of the green variety. I’m really conscious of how many fruits and vegetables I get in a day and if my consumption falls short, I’m quick to add one of these green “juices” into the mix. I know you guys see a lot of dessert around these parts, but I eat healthy stuff too, I swear. A couple of years ago I watched several Netflix documentaries regarding our eating habits these days and they all seemed to agree that juicing was a great habit to get into. I was intrigued and after some homework, bought a juicer and a ton of produce and got started. Um, my first attempt was a little discouraging. For starters, it took me like 3 hours to get half a glass of juice. Secondly, the juice was warm because my produce was. Have you ever tried warm celery, carrot and beet juice? I have, and I don’t recommend it. Ick. I was discouraged but kept on going, chilling my produce and following actual recipes for juices. Even once the juices were cold and tasted better, I quickly learned that as much as I liked how I felt when juicing, the cost and amount of work were really hard to keep up with. I mean hours of prep and cleanup for a few servings of juice. I started purchasing Bolthouse juices but I found they were too sweet and gave me a headache, in addition to really lacking in vegetables for the most part. I decided to just start blending spinach into my breakfast smoothies and this was by far the easiest and cheapest route for me. Drinking my greens makes me feel amazing. I’d always read that your body would start to crave green smoothies after getting used to them and I totally agree. I will feel physically ill if I go a couple of days without lots of greens now. Luckily two shops in our hotel in Vegas sold green juice or I would have been in big trouble. Lately, I haven’t been wanting a big frozen smoothie when the mornings are so chilly. I started opting for oatmeal but I felt that shift right away when I wasn’t getting as many greens and I knew I had to add them back in somehow. One day I tried blending just the greens with some orange juice to get the benefits without having to drink a huge, filling smoothie and now I totally love it. The texture is quite thin like a juice and there is a bit of a green taste but mostly it just tastes like orange juice. It makes a great snack or accompaniment to a meal, especially when you are under the weather and need an immunity boost. It’s also ridiculously simple and much cheaper and fresher than buying a green juice at the store. Give it a try and I promise you’ll feel like a million bucks soon enough. Pour the orange juice in the blender and pack the greens down right into the juice. Blend on high until totally combined. Enjoy! 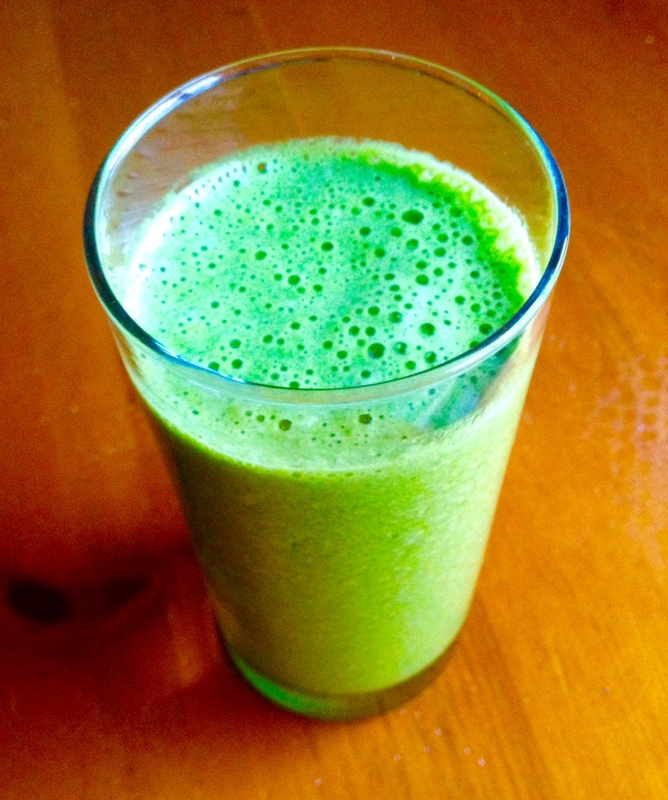 If this tastes a little too “green” for you, try replacing the kale with more spinach. Spinach has very little taste at all while kale can be more bitter. You can use any flavor of pure juice you like or even just water if you’re really brave. OJ is my fave. Serve the juice over ice; keeping it cold really improves the taste. 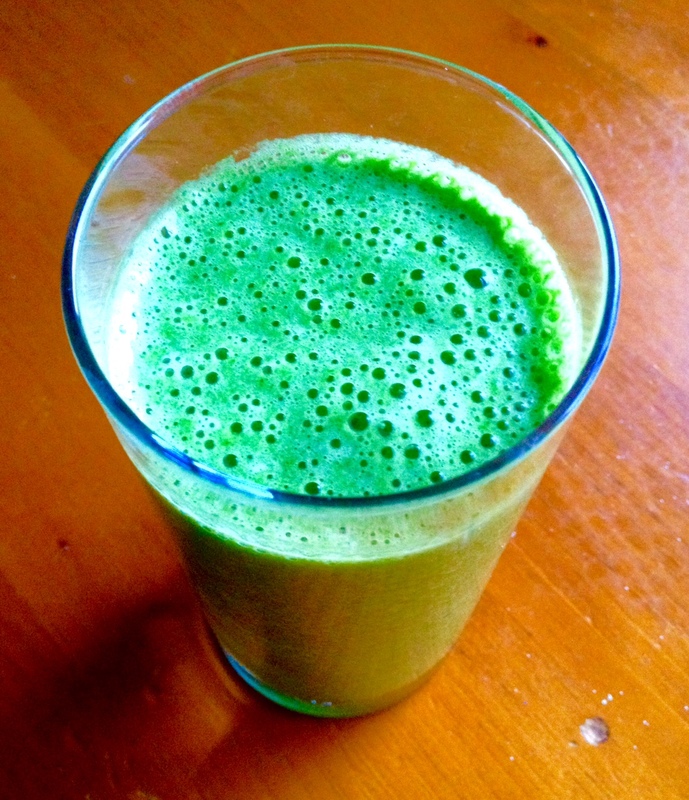 I love the Simple Green Smoothies website for inspiration for drinking my greens.